So there I was on Thanksgiving, enjoying the holiday with some wonderful people and their companion animals – Jasper, a nine year-old African Grey Parrot, and Pooh, a fluffy gray cat. Jasper and Pooh are good friends. 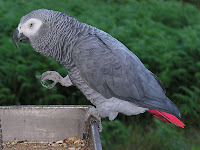 I know very little about parrots, except that they have a talent for imitating sounds and learning words. Jasper had a wide range of sounds, including the noise made by closing the microwave door and the clicking of dishes being washed in the sink. But my favorite sound was something very special – he could perfectly imitate Pooh’s meow. I don’t know why, but for some reason I was really touched by that. It gave me hope that maybe one day we really WILL all be able to get along. We can always hope that we’ll all, finally, be able to get along!